This little cutie is called Fella and is at the same rescue centre that we adopted Henry from. Could you offer him a new home? "This is Fella a 4 year old male Jack Russell. Fella has been handed in to us as his previous owner has become to ill to keep him. 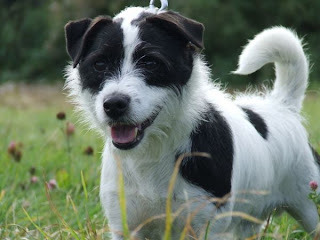 He is a friendly little boy but is a little bit nervous here in the kennels. Fella is good with other small dogs but does not like big dogs and he will chase cats. Fella travels well in the car and walks well both on and off the lead. He is also house trained and knows basic commands. Fella could live with children aged 8+ years."